CharityTools is a program that might be introduced to you as a charity tool. Regardless of how this program is promoted, we can guarantee you that it deserves immediate removal simply because it does not offer beneficial services and because it can introduce you to misleading ads. For this reason, our research team recognizes it as an advertisement-supported program. Needless to say, if you do not remove CharityTools from your operating system, the suspicious advertisements will keep showing up, and you want to get rid of them because any of them could put your virtual security at risk. 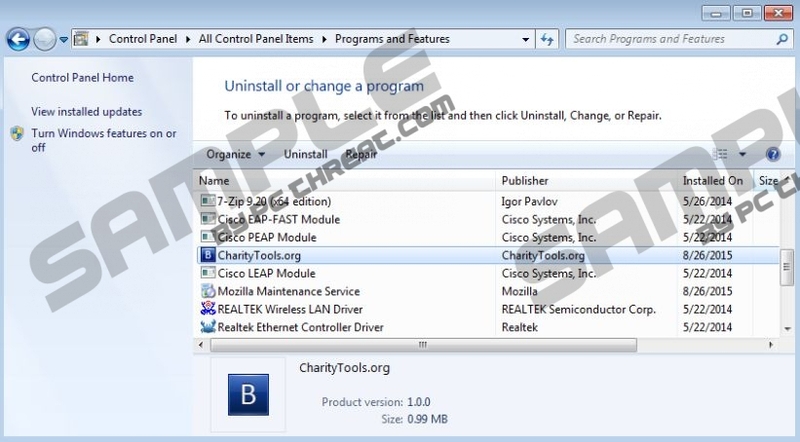 The representation of CharityTools is usually in the hands of third-party software distributors who might feed you fictitious information just to trick you into installing this useless program. If you do not install this program, the distributor will lose a commission. This is something that the creators of CharityTools are concerned about as well. If you do not interact with the ads injected, they will not be approached by advertisers who pay money to have ads injected into the sites you visit. This kind of system is known by the term “pay-per-click.” Unfortunately, irritating ads are likely to continue popping up whenever you browse the web until you delete the irritating ad-supported program. Although charitytools.org should represent CharityTools, this website is identical to runad.net, a site supporting Run Ad, which is the so-called “advertising platform specializing in audience targeting and retargeting.” It is most likely that this site was set up to lure parties who might be interested in using CharityTools or other suspicious ad-supported programs (e.g., BrowseForTheCause) that require removal. The files of this adware are signed by Domain Web Developers LLC, and it is possible that this is the company that stands behind Run Ad as well. Clearly, this company cares about its advertising partners and generating profit, not you or your virtual security, which is another reason to delete CharityTools. If you do not remove CharityTools now, it is only a matter of time before you encounter misleading and unreliable advertisements. Note that these advertisements might use attractive offers to lure you in, but you should not give in. One single click on an ad injected by this program could easily activate drive-by download attacks, and you want to keep as far away from them as possible. If you suspect that CharityTools has already let in malicious programs that require removal, immediately run a malware scanner to check if you need to delete dangerous infections. Make sure you delete them all. A legitimate anti-malware tool can ensure further system protection and the removal of currently active threats. If for some reason you do not want to invest in automated malware removal software, you have to make sure that CharityTools is deleted manually. If you are not experienced, it is likely that you will face many obstacles and problems because the infections installed along with this adware might be much more complex. The removal of CharityTools is straightforward, but we cannot predict if it will be as easy to eliminate all other threats. Move to Control Panel and double-click Add or Remove programs. Find the undesirable program and click the Remove button. Move to Control Panel and select Uninstall a program. Move the cursor to the bottom-right corner of the screen in Metro UI to access the Charm Bar. Click the Search icon, enter Uninstall a program, and launch this utility. Move to the Taskbar and type Control Panel into the search box. Launch this menu and select Uninstall a program. Quick & tested solution for CharityTools removal.